The title of this post is the hardest thing about making these cookies. The recipe is easy because there is very little measuring. I basically played with the measurements of the ingredients, and added coconut and more chocolate chips. I increased the butter a bit too, to help with the added volume. The original recipe on the bag says you need 1 egg and 2 tbsp butter, and the bag makes two servings. I find it’s easier to just throw the whole bag in a bowl and alter the ingredients accordingly. I don’t like small cookies, and I usually get around 36-40, though I’m not creating giant cookies. If you get 60 cookies out of this (as the bag says you can) then you’ll probably have awfully small cookies. 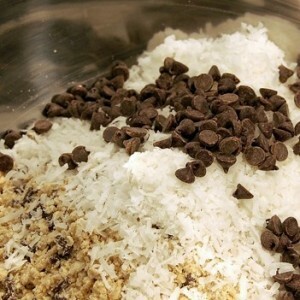 2.Throw cookie mix into bowl. Throw coconut in with it. 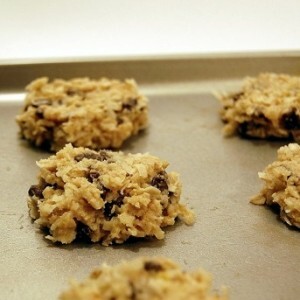 Add as many chocolate chips as you like. Add eggs, then 5 tbsp melted butter. Mix it up with a fork. Don’t use an electronic mixer. *I always only bake for exactly 10 minutes, and then put the pan in the freezer after they’ve cooled at room temperature for a minute or two. I like soft cookies, and the freezer seems to keep them from falling apart, even after they warm up later on.